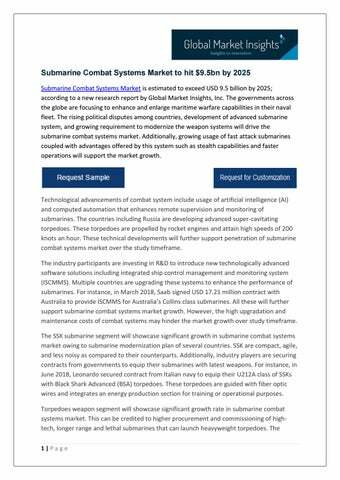 Submarine Combat Systems Market to hit $9.5bn by 2025 Submarine Combat Systems Market is estimated to exceed USD 9.5 billion by 2025; according to a new research report by Global Market Insights, Inc. The governments across the globe are focusing to enhance and enlarge maritime warfare capabilities in their naval fleet. 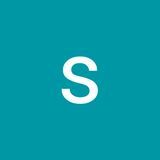 The rising political disputes among countries, development of advanced submarine system, and growing requirement to modernize the weapon systems will drive the submarine combat systems market. Additionally, growing usage of fast attack submarines coupled with advantages offered by this system such as stealth capabilities and faster operations will support the market growth. development of new torpedoes allow navy to destroy targets at ranges up to 5 miles and at speed greater than 28 knots. In addition, the new torpedoes are integrated with digital guidance, and digital fusing system and propulsion improvements. European submarine combat systems market share will hold dominance over the study timeframe. The dominance can be attributed to the purchase of new submarines and modernization of naval fleet by several countries. For instance, in 2016, the UK Defense Secretary approved the replacement of existing Vanguard submarines with four Dreadnought nuclear deterrent submarines. These submarines will be equipped with Trident D5 missiles and MK 48 torpedoes. Latin American submarine combat systems market will witness momentous gains over the study timeframe owing to upgradation of combat systems on existing submarine fleet as part of extensive defense programs. For instance, in 2014, Brazilian Navy announced to upgrade its four Tupi-class submarines with MK-48 torpedoes including extensive electronic refurbishment. The industry participants in the market includes Atlas Elektronik, Lockheed Martin, Northrop Grumman, Thales Group, Raytheon, and BAE Systems. The other notable players in the industry includes Saab, and Naval Group. Contract with the several navy forces is the key strategy adopted by industry participants to enhance their market share. For instance, in February 2019, Lockheed Martin announced that company received USD 20 million contract from the U.S. Navy to design and develop electronic warfare (EW) system.